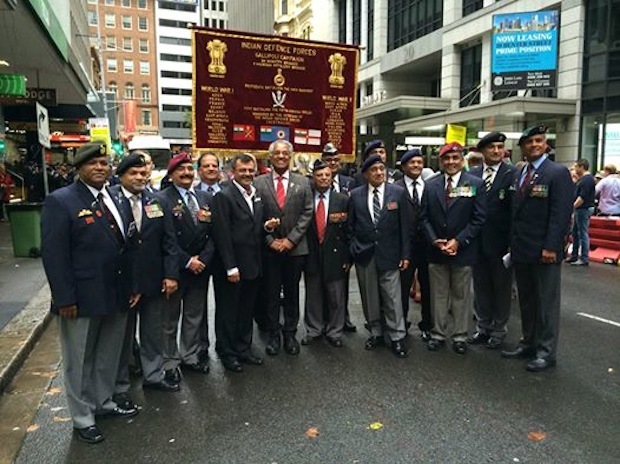 This photograph is from an Anzac Parade for the veterans of the Indian Armed Forces in Sydney. The marching contingent of Indian Veterans was received with cheers and the applause from the enthusiastic spectators lining the streets braving the wet and cold weather. The Indian banner stood high and proud, ably and graciously carried by a scout. Joined by their families and friends, the retired officers from Army, Air Force and Navy marched in unison, their suits adorned with their service medals. While they matched step with step, ‘stomachs-in, chest-out’ as instilled during their training days, the different berets symbolised the Corps or the Arm they represented. Will this ever happen in any Indian city? Will this remain a distant dream? A few weeks back there was a post on the Facebook where the author was unduly perturbed that India and its Asian neighbours did not figure in the top 25 patriotic countries, across the world, listed in the study of New York-based International Social Survey Program (ISSP). The study throws up interesting points like erstwhile colonies of the British and Spanish ranking higher than both Great Britain and Spain, respectively. According to the study, the most patriotic countries were the US and Venezuela, which were tied-up for the number one slot. The author was apparently more concerned about the ” holier than thou attitude” of Uncle Sam and that the conclusion has no rational basis other than their whims and fancies and prejudices. It is true. We Indians are the least patriotic. We do not have a national war memorial to date – India Gate was made by the British to pay respects to all the fallen soldiers of World War I. We do not fly the national flag at half mast when a soldier is martyred unlike US/Canada. We do not line up the streets to pay homage to a fallen soldier as their mortal remains pass through our city/village/town. Our airlines do not even bother to show any respect to the coffins of the soldiers and handle them as ordinary cargo. The Captain of the flight never announces that the mortal remains of a soldier is being carried by them. (Latest being Major Varadarajan’s case). We do not commemorate any Remembrance Day to pay respect for a fallen soldier as in the case of most Commonwealth and Western Countries. Our National leaders or citizens never wear the flags pinned on them by the children on the Flag Day. How can we say that we are patriotic? Every Indian cries when the ball hit Sachin Tendulkar’s chest, but none even stops to think about the bullets hitting our soldiers’ chests. We call out the Army every time the Indian Police Force fails, but all the promotions and pay is given to them and the Army is forgotten, especially during the pay commissions. We remember the Army only when a calamity strikes us or when a child falls into a bore well and forget about them immediately. Our Parliament passes bills to ensure better pension benefits for all its MPs – whether they did anything or not; whether they attended the sessions or not: but the same Government does not want to implement the One Rank One Pension scheme for its Soldiers. Now show me our patriotism other than during the cricket matches???? This weekend we went to watch baseball game at the Rogers Centre, Toronto between the Toronto Blue Jays and the Tampa Bay Rays. The Rogers Centre is the home-ground of the Blue Jays. The atmosphere was as electric as the cricket matches of the Indian Premier League. The stadium was fully wheel-chair accessible and there were ramps made so as to facilitate the wheel-chair bound fans to enjoy the game. Even the latest stadium in Pune is not wheel chair accessible, so forget about the rest. The fans at the Rogers Centre fanned across all ages – children, teens, youth, seniors. One event during the two minute interval between the first innings really stood out. A sixty year old Veteran from the Canadian Army who was a Captain and had served in many UN assignments was called on to the centre and the Team Management of the Blue Jays presented him with a team shirt with his name printed at the back and with the team captain’s signature in the front. The entire stadium stood up to give the veteran a standing ovation – no one instructed anyone to do it, but was spontaneous. This is what is called patriotism. Our son then said that during all the matches, a veteran from the armed forces or the police forces, who is a registered fan of the Blue Jays, is honoured this way. Can we ever expect such a gesture at Mohali from the Kings XI Punjab or at Chennai from the Chennai Super Kings? Why one veteran, we can always honour a dozen at every match.